A sign adorning the wing named after the Sackler family at Metropolitan Museum of Art in New York. An enormous federal lawsuit out of New York is the latest and most brazen attempt to explicitly tie the billionaire Sackler family, owners of Purdue Pharma, to the opioid crisis. It accuses them of knowingly misleading the public about the addictiveness of their drugs, as well as turning a blind eye to doctors who were accused of prescribing dangerously high doses or diverting their supply to the black market. 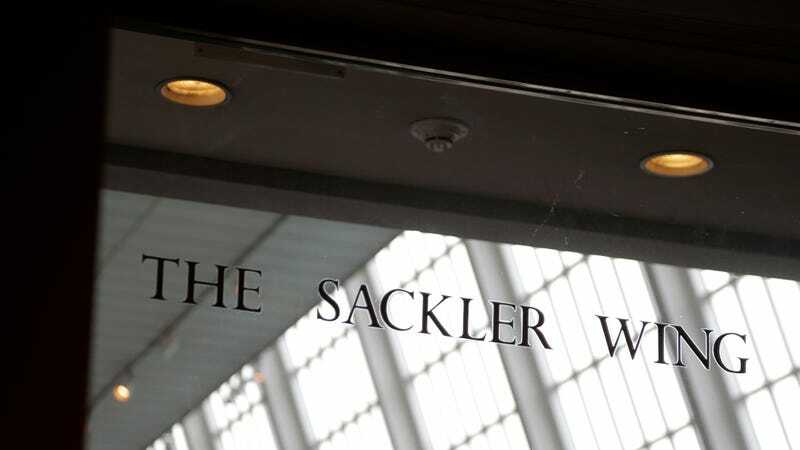 This week, a coalition of over 500 cities, counties, and Native American tribes sued eight members of the Sackler family in the southern district of New York, the Guardian reported. Purdue and its executives have long faced accusations over their handling and marketing of OxyContin, their once-blockbuster painkiller. In 2007, the company agreed to plead guilty to criminal charges of misbranding OxyContin and paid a $600 million fine. However, state and local lawsuits have continued to accuse the company of doing little to change since that time. These ongoing legal troubles and financial struggles have reportedly led Purdue to consider filing for bankruptcy, a move that might allow the company to stay afloat and possibly limit the amount of money plaintiffs from these cases might eventually be entitled to from a settlement or court victory. But what makes the current lawsuit in New York (which is separate from another lawsuit filed by the New York attorney general last fall) so notable is that it really doesn’t go after Purdue at all, but rather individual members of the Sackler family. According to the Guardian, the lawsuit names Richard Sackler, Jonathan Sackler—sons of the late Raymond Sackler, one of the founders of Purdue—as well as Beverly Sackler, Raymond’s widow, and David Sackler, Raymond’s grandson. Ilene Sackler Lefcourt, Kathe Sackler, and Mortimer David Alfons Sackler, children of another founding member, Mortimer Sackler, are also named, as is Theresa Sackler, the widow of Mortimer Sr.
“Eight people in a single family made the choices that caused much of the opioid epidemic,” stated the lawsuit, according to the Guardian. It’s estimated that over 60,000 people died from opioid overdose in 2017 alone, with more than 17,000 deaths involving prescription opioids. These same people were named as co-defendants in an ongoing lawsuit by the Massachusetts Attorney General, and some of the same allegations—most notably about former Purdue chairman and president Richard Sackler’s aggressive push to drive up OxyContin sales—have been made public from unsealed court documents in other litigation. But the Massachusetts lawsuit still names Purdue, while other cases have gone after more than one opioid maker. The New York case, by comparison, only names a family trust of Raymond Sackler’s and Rhodes Pharmaceuticals, a subsidiary of Purdue that makes generic opioid medications, in addition to the Sackers. It is true that public opinion has dramatically shifted against the Sacklers, who were once much better known for their philanthropy to the arts and museums. More recently, organizations such as the National Portrait Gallery and The Tate Galleries in the UK have announced they will no longer accept donations from the Sacklers, while the Metropolitan Museum of Art announced in January it would reevaluate its donation policy, following a long history of taking Sackler money and even naming one of its wings after the family. Plaintiffs in the New York lawsuit include authorities from cities and counties in more than a dozen states, including Alabama, California and Florida, as well as eight Native American tribes.